Description: This is a white cassette tape recorder with a red face, multi-colored buttons across top (red Stop/Eject, green Play, yellow Forward and Reverse and green Record), a red volume control knob on side. 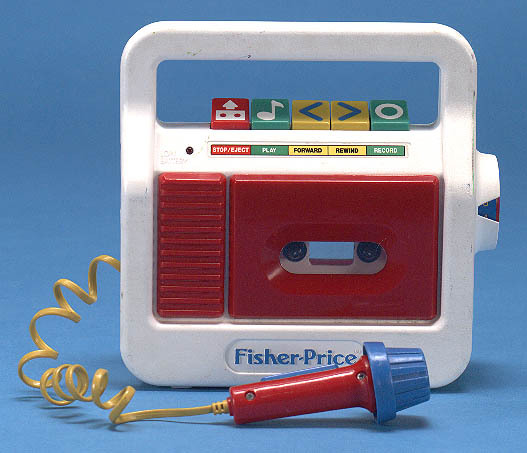 It has a red and blue hand-held microphone on the side to sing along or record. The microphone is attached via yellow cord. Requires four C-size batteries (not included). Designed for children ages 3 years and older. FPT10138 - Sold in a 13" long, 12-1/5" high, 3-1/8" deep display box. FPT10139 - This tape recorder was sold with a two year limited warranty. This is a reissue of 1988-1990's #3808 Tape Recorder. The only difference between #3818 and #3808 is the color of the control buttons and microphone. The #3808 has black control buttons and a red and black microphone.